As June winds down, American Flowers Week starts. Why not design a promotion around the week – set for June 28-July 4? 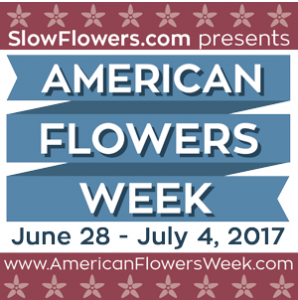 American Flowers Week is and advocacy, education and outreach campaign co-produced by the Slow Flowers Podcast with Debra Prinzing and Slowflowers.com. Now in its third year, American flowers advocate and journalist Debra Prinzing created the U.S. version of the domestic flowers promotion campaign with inspiration from British Flowers Week. The week seeks to heighten the attention to the importance and value of American Grown Flowers. Use the #americanflowersweek hashtag to draw attention to your efforts during this exciting week and help spread the origin matters message.